It should come as no surprise that the upcoming Royal Wedding has sent some into a frenzy. In these troubling times the world could use an old fashioned love story. Strange that England should provide it, but they've corned the wild love market since the last major wedding. Handsome (?) prince meets adorable commoner and they fall in love. Now, with the second step of the old "Love, Marriage, then Baby Carriage" game set to commence on Friday the world is taking notice. All week long the major networks have been covering everything from the royal route to the bettors taking odds on whether Prince William will get stood up at the altar. In all this fervor there are a few important items of note. Major fast food chains made food based on the wedding. I'm going to show you three of them, starting with the most sane and delving into the pits of insanity. First, a nice gesture from Baskin Robbins. They've created an ice cream wedding cake. Let it be known that I will demand an ice cream cake for my wedding. 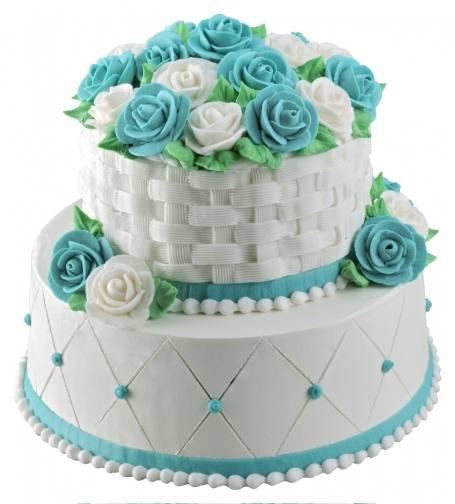 The cake is meant to resemble a basket of flowers and the colors of the cake aim to mimic the colors of Kate Middleton's ring. This is only a little bit strange. 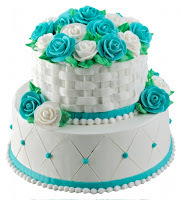 The fact that you could buy a one or two-tier cake seems unnecessary (and a two-tier ice cream cake sounds unwieldy). But there is a sort of practicality to this item. You throw a Royal Wedding party and you're gonna need cake. Next we come to our old friends Dunkin' Donuts. That oozing pastry above is the Royal Wedding donut. 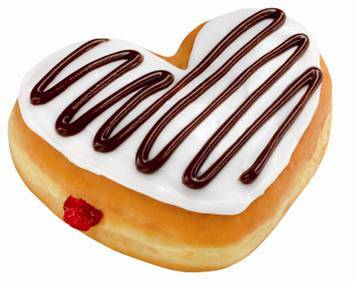 Jelly filled, vanilla icing glazed and topped with a chocolate drizzle, this little oddity is meant to celebrate the young lovers. If you've just said "huh?" or "how?" we're right there with you. According to the news story, "the company's British-born chief executive Nigel Travis—born and raised in Woodford, Essex—is particularly excited about the royal nuptial." So he declared all U.S. Dunkin' Donuts make these British wedding doughnuts? Very strange. Finally, yes, you're looking at what you think you're looking at. 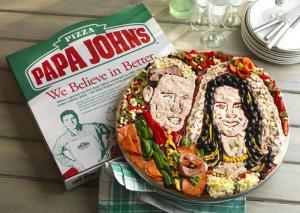 Poppa John's Pizza has enlisted a British food artist create a pizza portrait of the happy couple. Ms. Middleton has mushroom hair. The good prince has a pepperoni suit. And this isn't just an (insane) marking mock up. This is a one of a kind pizza that will be delivered to a lucky Brit! Only available in the UK, pizza hopefuls* can email in to win the pizza and have it delivered (est. retail value of prize: ten bucks). Oh we live in a strange world. How have we developed to love food so much that we could thrust it, en masse, upon ourselves as markers of a special occasion? At least in Britain they're all throwing big house and lawn parties for the wedding, making it a national holiday. Here we'll be grabbing a royal doughnut before we go to casual friday in our khakis and button-up shirts. *aren't we all just "pizza hopefuls"